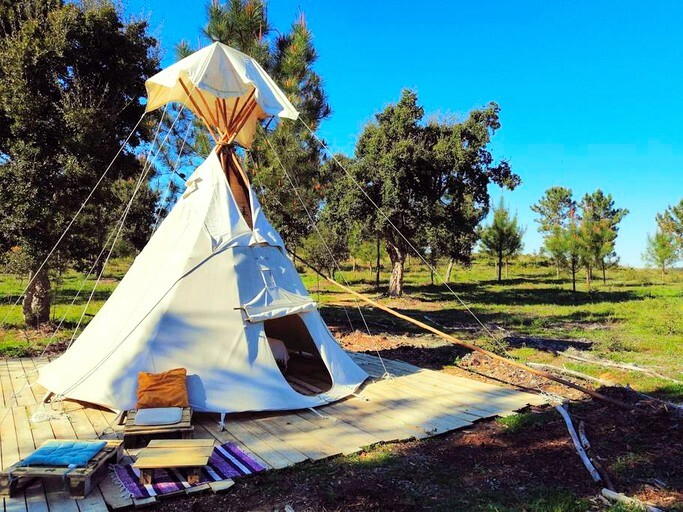 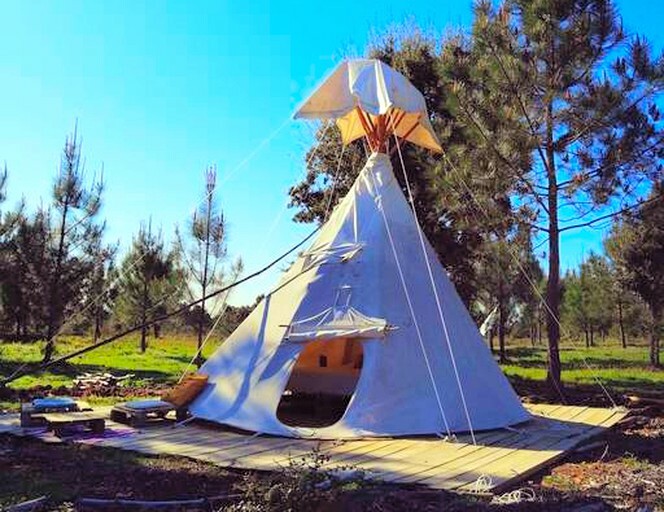 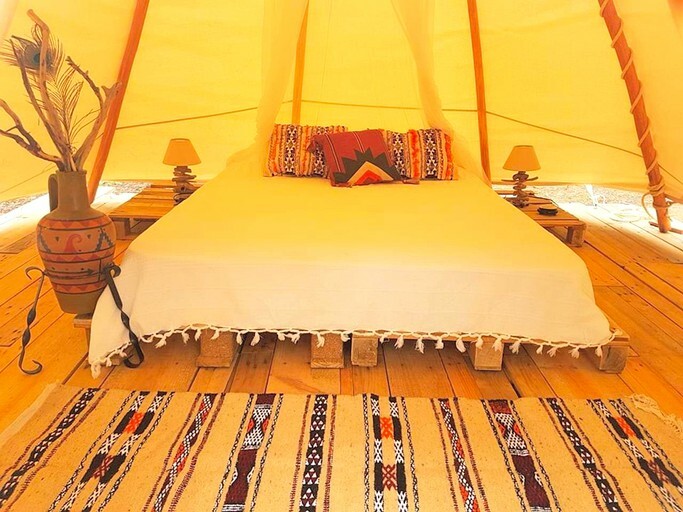 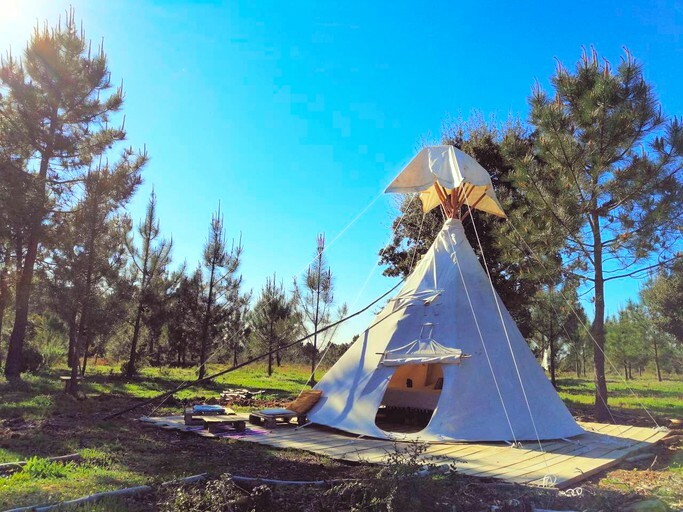 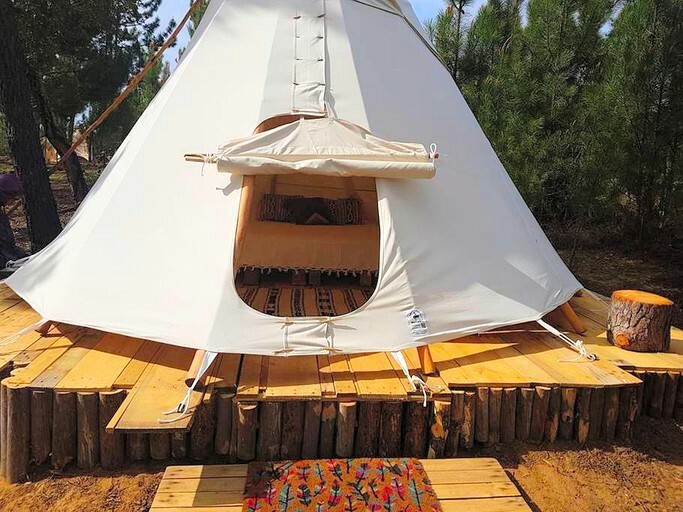 This rustic yet elegant tipi is perfectly located near Aljezur in the Algarve region of Portugal and can accommodate two glampers for an eco-friendly getaway. 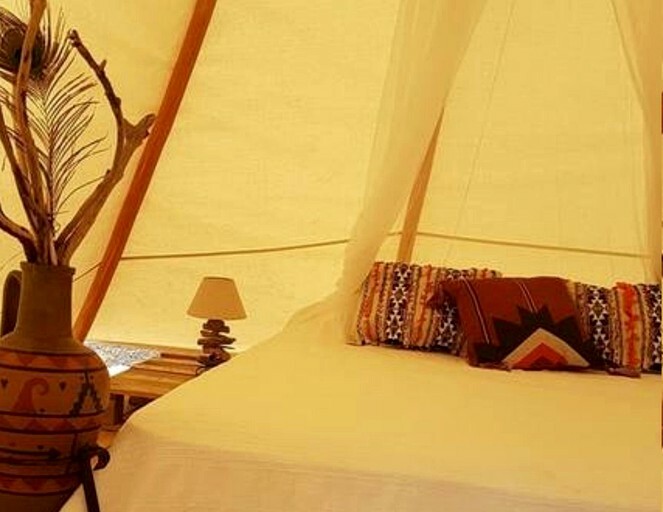 Here, glampers can get back in touch with nature and enjoy the quiet surroundings while accessing local attractions and the stunning beaches with ease. 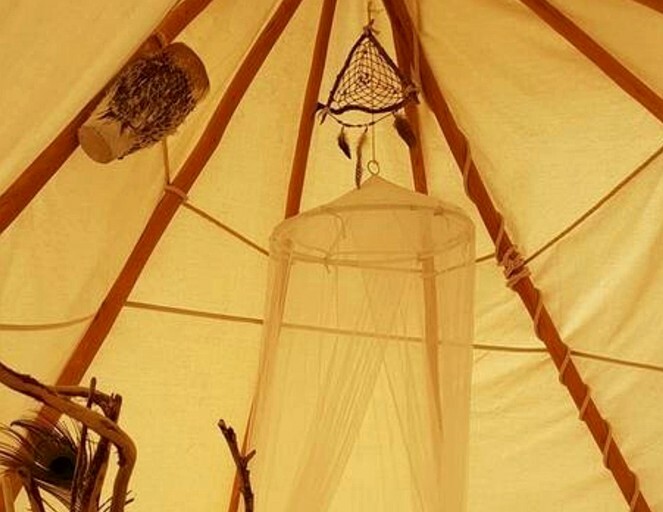 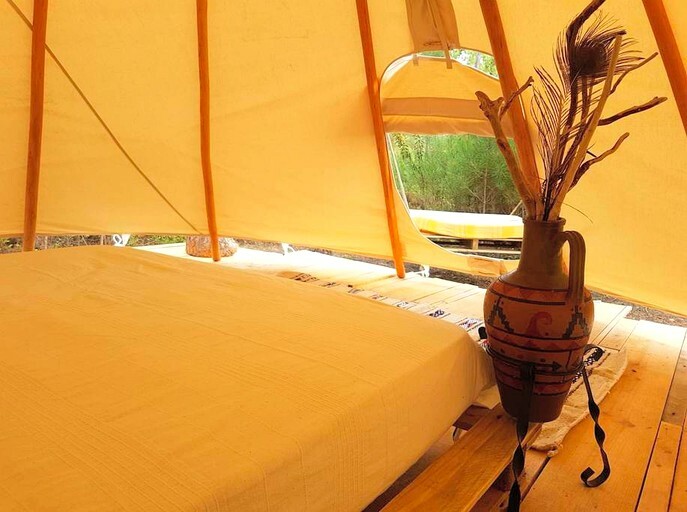 The tipi boasts a plush bed dressed in fine linen, wooden flooring, and two bedside tables. 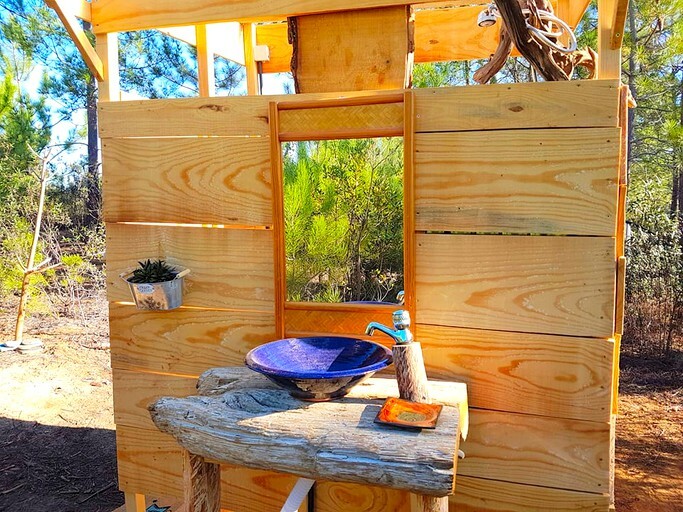 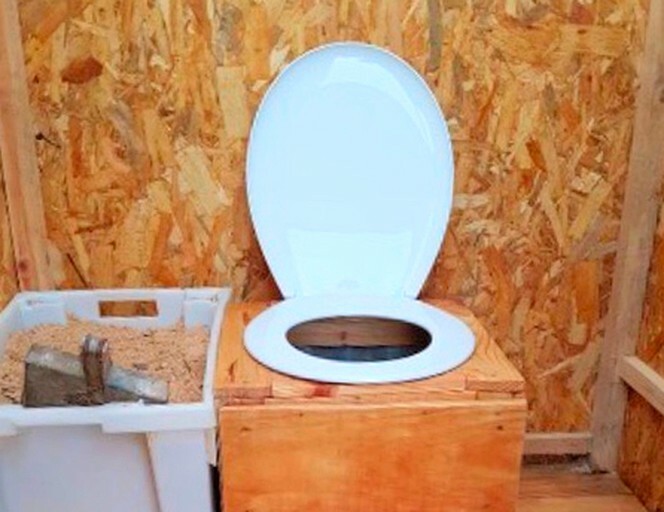 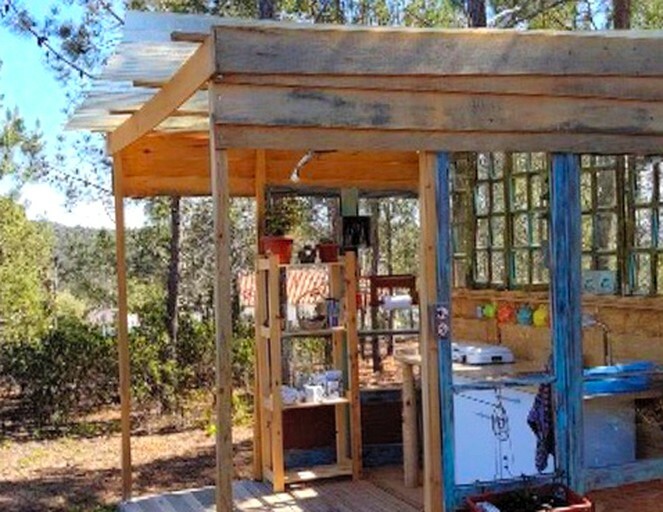 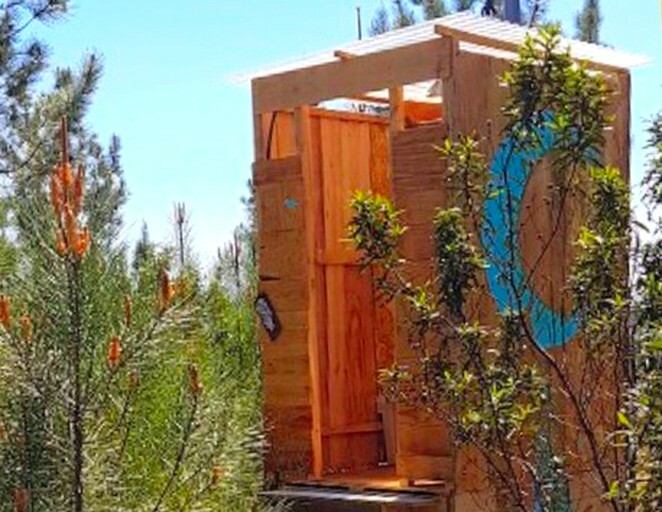 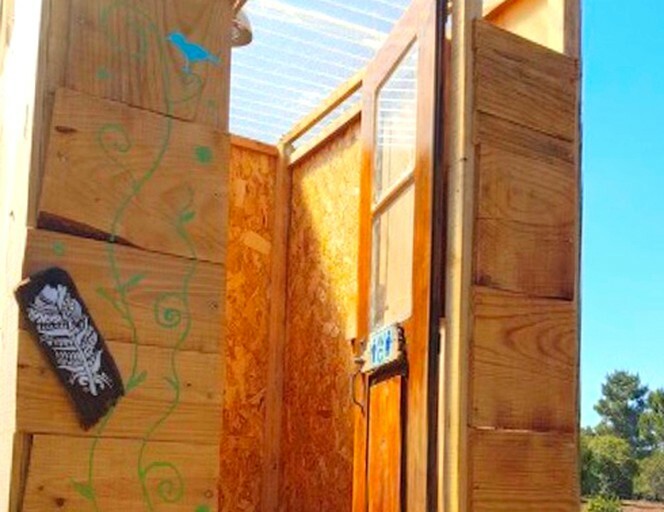 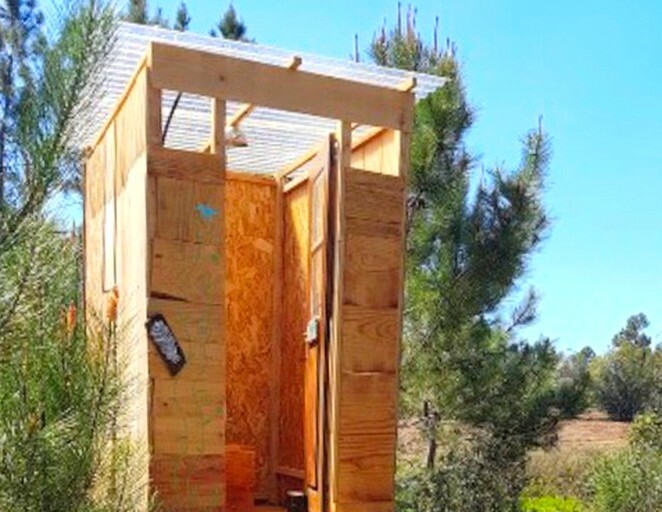 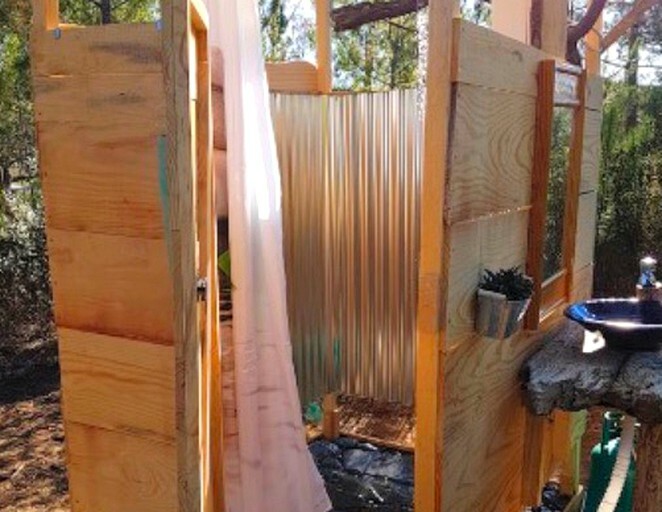 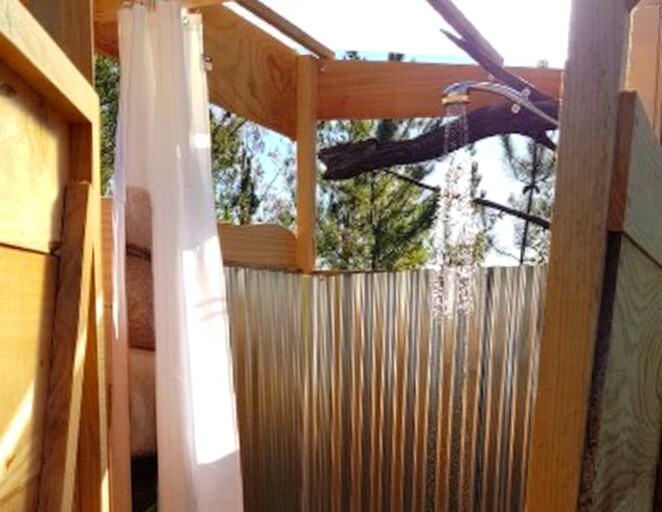 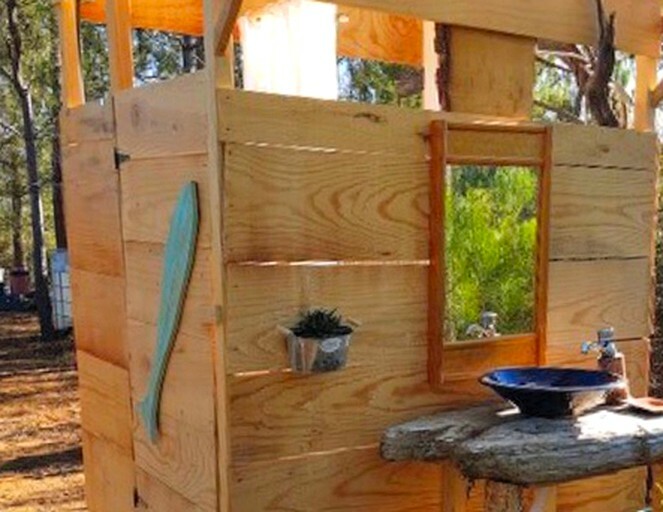 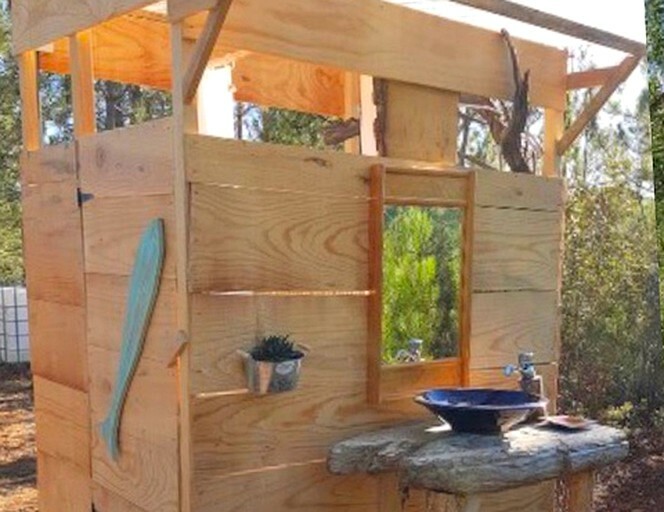 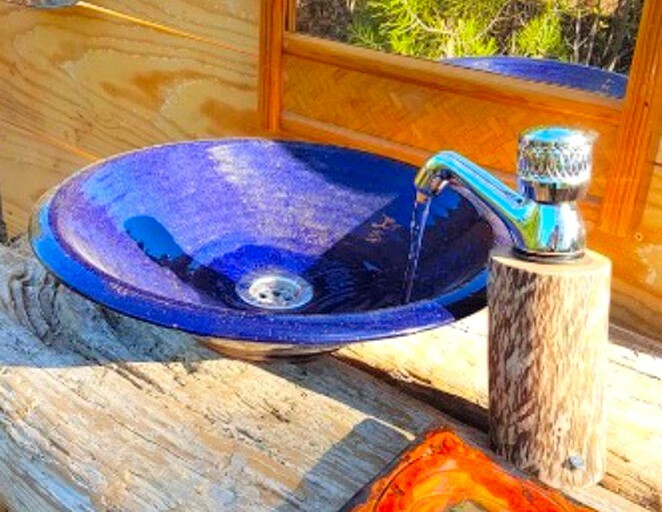 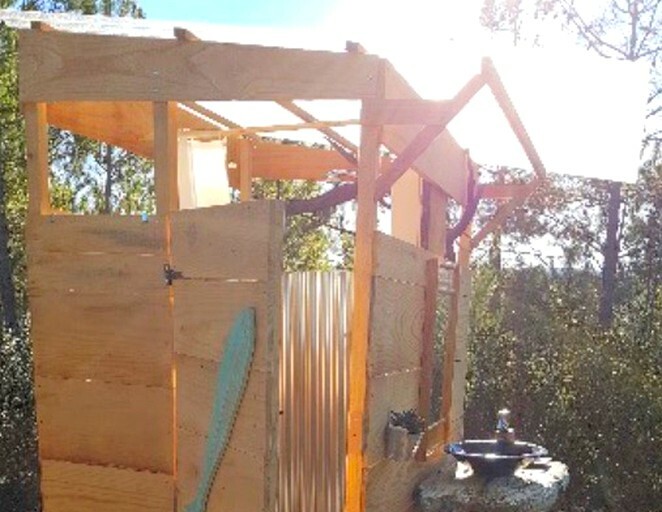 Eco-composting toilets and shower facilities are available for glampers. 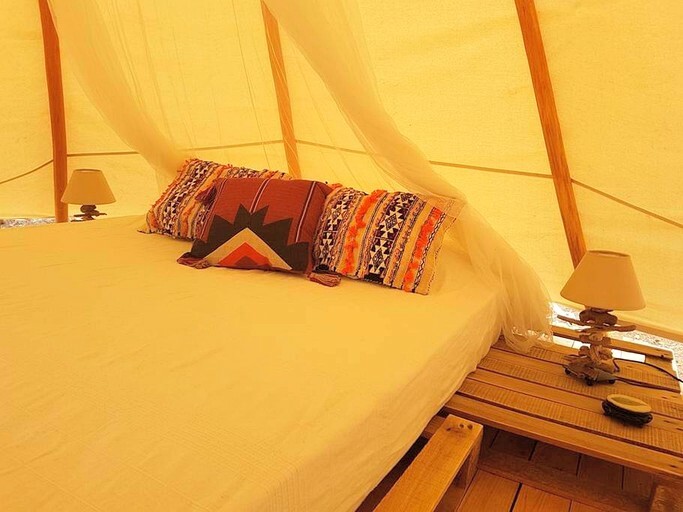 This accommodation is the perfect getaway for those looking for a respite from everyday life. 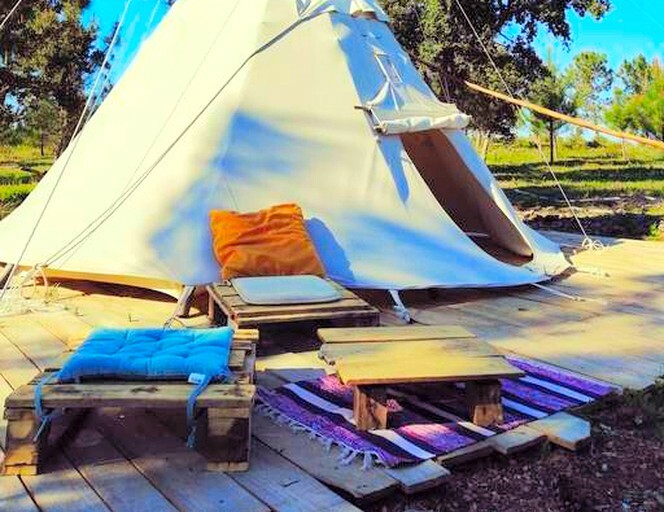 Here, glampers will enjoy privacy and comfort surrounded by stunning natural beauty. 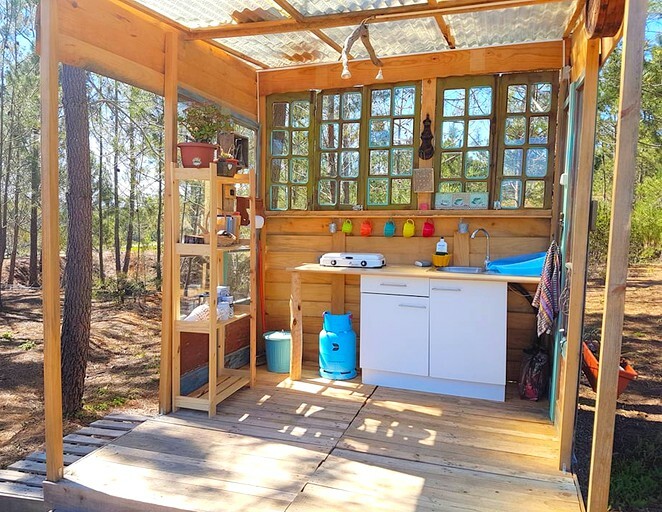 The hosts provide linen and other essentials and there is a common eco-composting toilet and shower facility for guests to use. 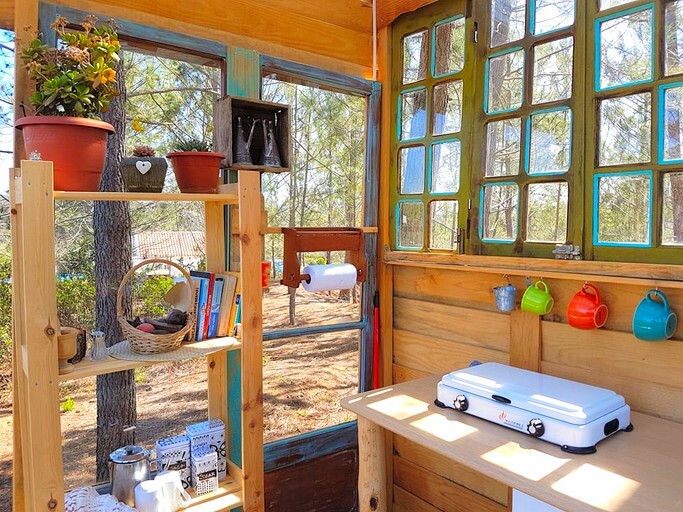 Additionally, the common kitchen has everything guests will need to prepare some snacks when hunger strikes. 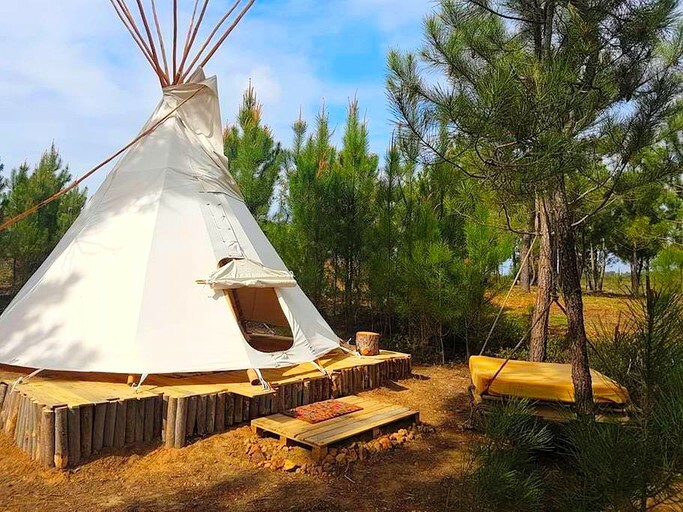 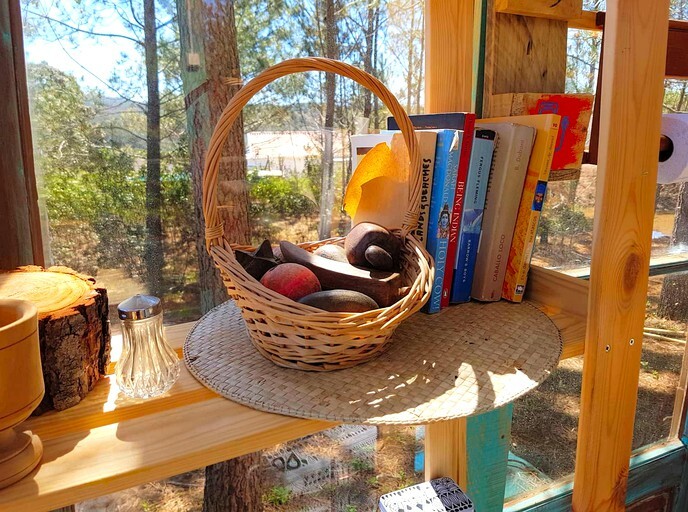 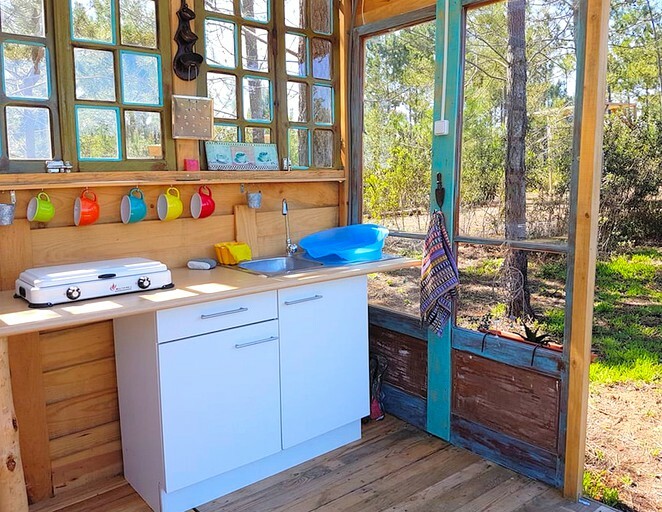 This rustic accommodation is ideally located for nature lovers to explore the surrounding national park, Parque Natural do Sudoeste Alentejano e Costa Vicentina. 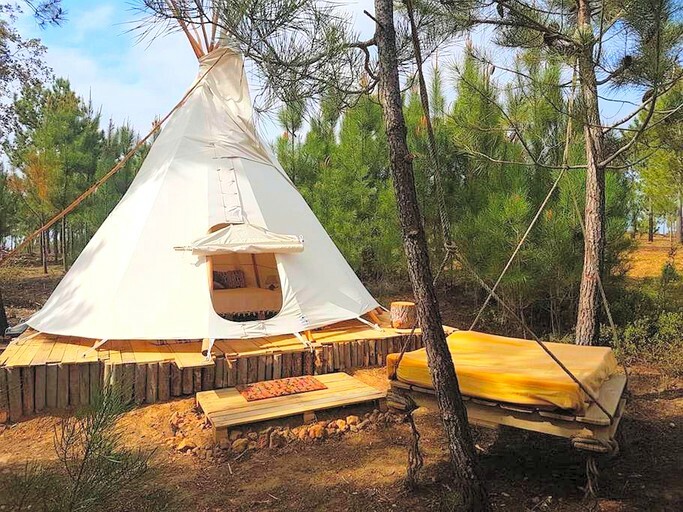 The National Park boasts 100 kilometers of protected beach along the Atlantic Coast of the Algarve and offers perfect photo opportunities with a dramatic coastline and rugged cliffs. 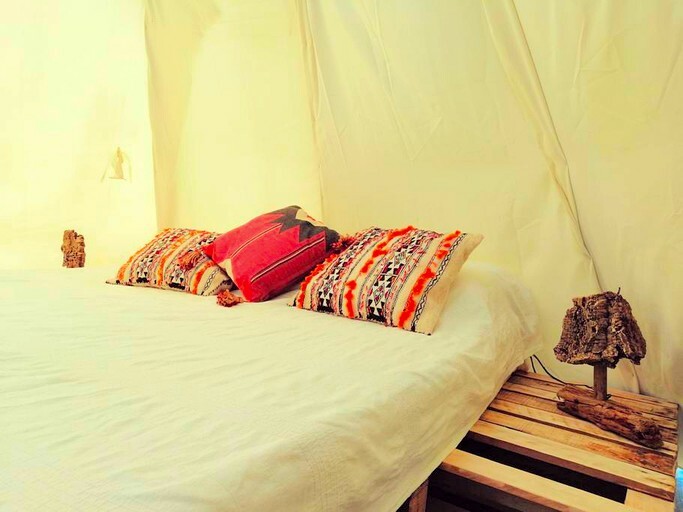 A short drive will take glampers to one of the finest beaches in the Algarve, Praia do Beliche. 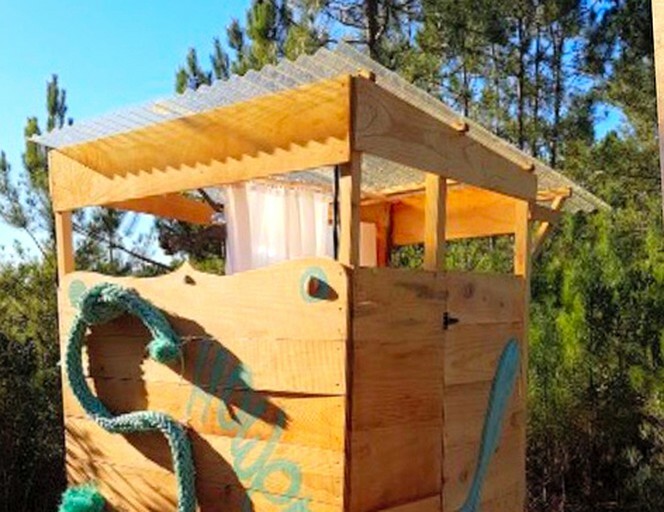 where they will descend steep steps to a stunning beach hugged by 40-meter cliffs. 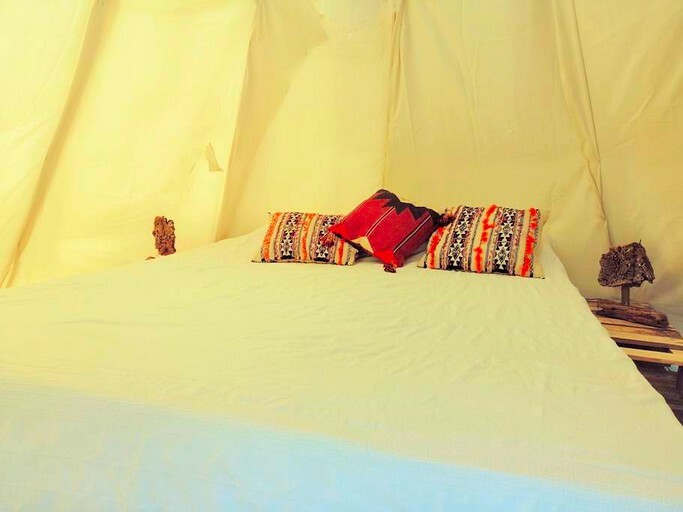 Here, glampers can sunbathe and swim, and for advanced surfers, Praia do Beliche is notorious for its epic swell. 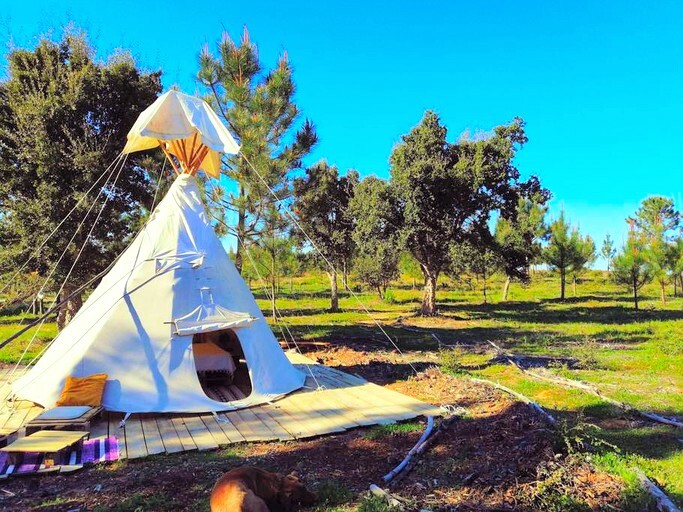 For a reprieve from the water, history buffs can visit the ruins of a 10th-century Moorish castle which sits atop a hill in the historic town center of Aljezur. 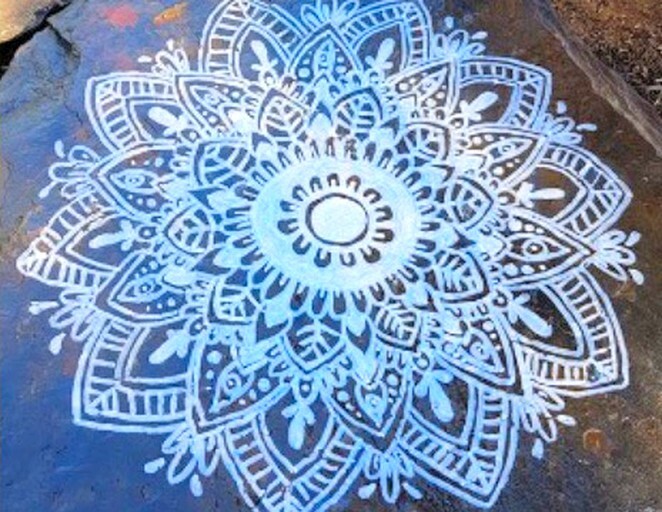 The ruins afford sublime views of countryside scattered with whitewashed houses, cobbled streets down the hillside, and blossoming wildflowers in the summertime. Mountain biking, trekking through the natural beauty of the area, and a donkey or horse riding tour are great ways to explore Aljezur, where glampers are afforded the opportunity to spot some wildlife native to the area. 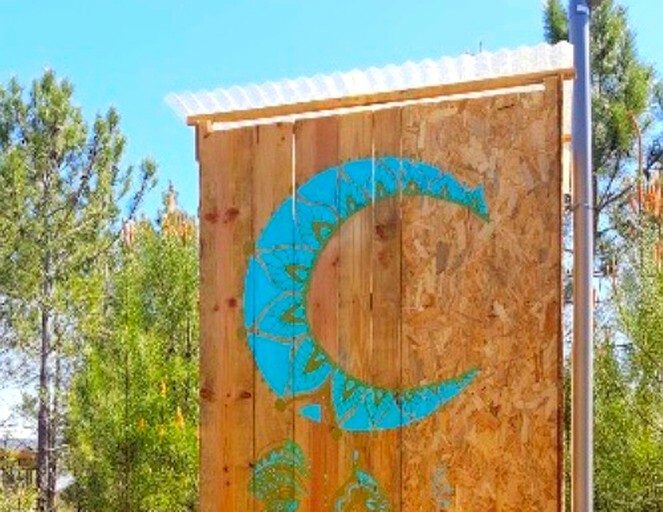 Smoking, parties, and events are not permitted on-site.